There are many pros and cons for having security cameras in a classroom setting. Because there are compelling arguments from both sides, including from teachers, parents, students, and administrators, this makes for an excellent debate topic. Among proponents of classroom security cameras, many cite safety and behavior management as the top reasons. Mass shootings on campus have risen at an alarming rate, with more deaths in the past 18 years compared to the 20th century. Currently, around 80 percent of public schools use security cameras hoping they may help mitigate misconduct and violence on campus. School violence has propelled many schools to begin looking into more intense security measures with the hope of deterring inappropriate behavior. Increasing security has been correlated with larger schools; average enrollment is close to 1,000 students. There also appears to be a connection with schools in neighborhoods where crime is more prevalent. Those who support camera usage suggest that it can be used to hold students accountable for their behavior. Video footage can be used for evidence for classroom misconduct and instances of bullying too. Classroom cameras can be used to hold teachers accountable for their behavior. This can be a source of comfort for many parents. Viewing positive interactions between students and the teacher can help foster parental trust in the school as well as with staff. Research notes that parents who have a good relationship with teachers tend to have children who are more successful academically. Research has illustrated that collaborating with colleagues and other higher-up administrators can improve teaching methods. Doing so can help improve insight and provide new and fresh ideas for teachers to experiment with. Reviewing footage can encourage teachers to evaluate their teaching methods while striving to provide the best learning environment possible for their students. Studies have suggested that using video footage can help those working with others better answer questions that come up in an organic, non-clinical way. According to a comprehensive study on exclusion, security cameras may create a feeling of alienation for some students and can incite a negative view of the school environment. Parents may not feel comfortable with their children being taped by the school without their presence as well. The financial costs are considerable as well. One Ohio school district spent over $60,000 in cameras over five years, plus $22,500 in software setup and annual fees of over $28,000. Setting up surveillance cameras in classrooms can make for an atmosphere of mistrust and lack of safety in a school environment. Students who have experienced cameras in the classroom report feeling a lack of trust between the school and themselves. School teachers too may feel an invasion of privacy being filmed all day, especially if they are anxious about being on camera. 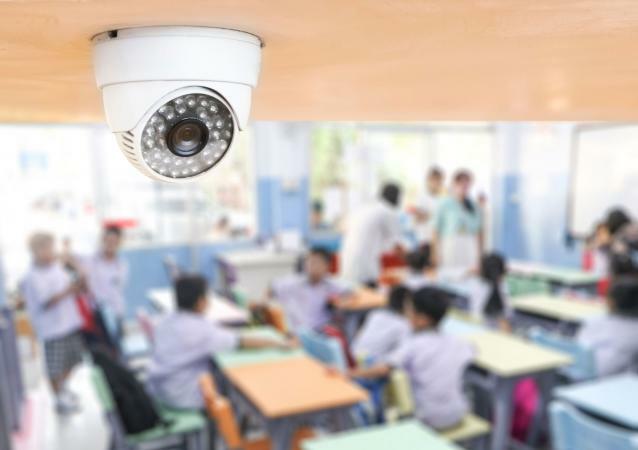 As counterintuitive as it may sound, classroom security cameras have been shown to increase the amount of crime in a school setting, excluding property damage. Not only are they expensive, but cameras are actually increasing the disciplinary issues that the school needs to handle. Another big consideration is that violence is more likely to take place in hallways, bathrooms, and stairwells rendering classroom cameras ineffective. Cameras may also contribute to the "school to prison pipeline" effect where harsher punishments and zero policy tolerance actually up the overall crime rate. In a study that compiled two large national surveys of about 40,000 students, researchers examined the impact that school security had on students. Researchers found that heavy surveillance had a moderate impact on hindering academic achievement. Others argue that in an attempt to make schools safe, other important factors are put on the back burner, such as academic success and school culture. Depending on the school's particular policy, security cameras are typically acceptable in hallways, parking structures, the gym, and supply rooms, as well as in classrooms. Unless the school has a personal policy against having cameras on campus, legally it is acceptable to install them. School officials can also confirm with the school's lawyer. Although many people cite privacy issues when it comes to security camera installation, it is not technically illegal to do so in the classroom. Under the Family Education Rights and Privacy Act (FERPA), which protects confidential student records, security footage of students would fall under this umbrella and should be stored appropriately. Under this act, students and parents have the right to inspect the video footage, and schools would need a signed form before releasing any footage. Installing or choosing to refrain from installing security cameras in classrooms will ultimately depend on what administrators, parents and teachers feel is best in terms of addressing the needs of the school. When it comes to security cameras in school classrooms, there are strong arguments against the issue, as well as equally poignant arguments that support it.